Cool crocs are the stars of this online pokie from Microgaming that’s in the classic 3-reel and single winline format which players have been enjoying for so many years. As such, it’s a very straightforward game that experienced players will enjoy and total newcomers to the world of 3-reel pokies will pick up the basics in no time. It’s a fun game to get your teeth into, with no real complications or distractions from the business of spinning the reels and waiting for wins to come your way. 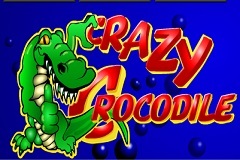 Like many other pokies from Microgaming, Crazy Crocodile follows a set pattern and design, with the reels at the top of the screen and an image that sets the scene below them. In this case it’s an anthropomorphic alligator (I know it’s a crocodile, but you try finding something that rhymes with it), giving it the thumbs up and generally looking like he’s having a good time. The payout table dominates the right side of the game, and it’s all set against a fairly simple backdrop of water with a few bubbles in it just to make sure that players know what they are looking at. It’s the buttons along the bottom of the screen that they will need to understand before the game begins, as these adjust the bet size and the number of coins wagered per spin. Coin values can be adjusted from as little as 0.25 through 0.50, 1.00, 2.00 and 5.00, while players can choose to activate 1, 2 or 3 coins. Add all of that up and we get a maximum stake of 15.00 a go, which isn’t a particularly wide range and could mean that those on the smallest of budgets, or those who like to bet big won’t find this game suitable for them. The payout table has 3 columns that details how many coins will be won each time a row of symbols stops across the winline, and whichever one is lit up depends on how many coins are in play, so it’s easy to see what prizes will be claimed for 1, 2 or 3 of them. To make it easy, we’ll assume a single coin is in use and if needed, just double or triple it accordingly. Most of the symbols are very traditional, although our friendly croc takes up the bottom of the table with a single one being worth 2 coins and if a couple of crazy crocs land on a line then there’s a 5-coin prize. Above this are the classic bar symbols, with any bar being worth 2 coins, then the single, double and triple-bar icons carry values of 10x, 20x and 50x the amount bet on a spin of the reels. The crocodile makes a re-appearance at the top of the table – twice, as any time he lands in view, not necessarily on the line, he treats players to a healthy prize of 200 coins, and a full line of crocodile equals the jackpot win of 1000 coins. These combinations are where playing 2 or 3 coins will really make a difference, as rather than being doubled or tripled which gives the same bet to win ratio, they are multiplied by 2.5x for a 2-coin bet and the 3-coin prizes are 1000x and 4000x respectively. A Snappy Game with Bite? Crazy Crocodile is very typical of Microgamings’ 3-reel pokies, which is a good thing, as they are masters of this format and have brought out numerous titles that play in a very similar way. It may not be for everyone, but those looking for a fun theme, with high value symbols will enjoy spinning these reels. A potential issue is the very limited betting range and perhaps it would have been nice to see a wild symbol that could have created some extra winning spins, but overall this is a quality game from a trusted developer.